A new version of Click&Clean v7.9 has been released! A special thanks to all users that made a donation to the project and helped us to improve the tool. Today, it is imperative to safeguard people's sensitive personal data and prevent any private information leakage. 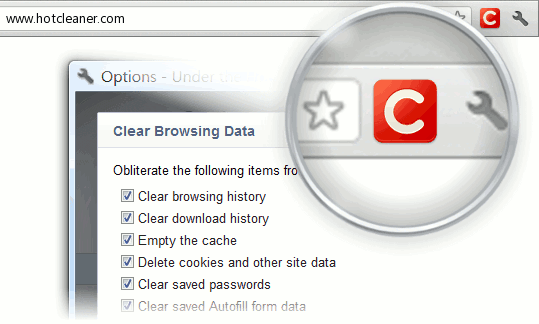 With each new version of Click&Clean, we try to provide you with an easy-to-use and cost-effective way to keep your private data private and safe from others. • Choose an Action: The main new feature added in this version is the ability to choose the action to perform when you click the Click&Clean button on the main Chrome tool bar (Pic.1) There are two basic actions you can choose from: open Clear Browsing Data dialog (the default action for new installations) or expand a handy menu of features. • Change how Click&Clean menu looks using skins: It is easy to give Click&Clean a new look by applying a skin. Changing a skin is easy! Pic.1 Click&Clean button at the right side of Chrome's address bar.